and became Platinum in the US and Germany. 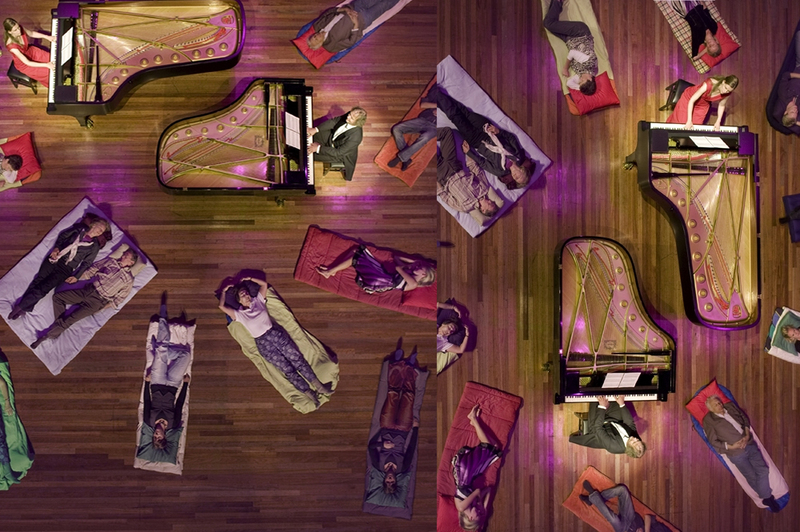 Tiersen’s music helped to make the movie a hit, capturing its bittersweet mix of humour and sadness, and many of the best‐known pieces from the soundtrack are included on this new album, such as the Satie‐tinged ‘Waltz of Amélie’, but there is much more recent music here which Tiersen wrote in the wake of the film’s success, including extracts from his soundtracks to Goodbye Lenin (2003) and Tabarly (2008), which tells the tragic story of the French sailor Eric Tabarly, who won the Single‐Handed Transatlantic Yacht Race twice before drowning in the Irish Sea. 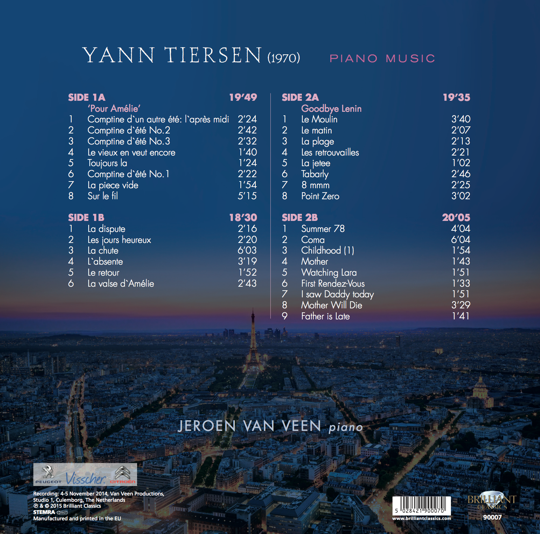 Tiersen’s music is often melancholy and reflective, but there are many lighter and more uptempo numbers on this wideranging survey of his output, which is sure to share the popular success of Jeroen van Veen’s many other albums for Brilliant Classics such as his Minimalist Piano Collections (BC8551 and BC9171) and compendiums of Ludovico Einaudi (BC94910 and BC9452), Simeon ten Holt (BC9434 and BC9453) and Jacob ter Veldhuis (BC94873). recommending to anyone who enjoys minimalism’ (Fanfare). French composer Yann Tiersen (born 1970) is one of the most popular and successful film music writers of today. His soulful and melancholic music finds its traces in folk music, French chansons, musette waltzes, street music, but also in the minimalism of Satie, Glass and Nyman. His international breakthrough came with the music for the French blockbuster “Amélie”. Later followed “Goodbye Lenin” and others. 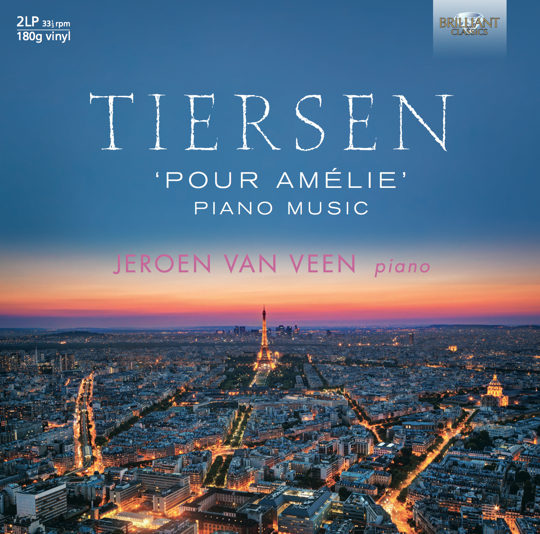 Dutch pianist, pioneer and champion of Minimalism Jeroen van Veen recorded Tiersen’s most popular melodies, playing the piano in his inimitable way: focussed, serene and hypnotising. A worthy successor of Van Veen’s successful recordings for Brilliant Classics of piano music by Glass, Pärt, Yiruma and many others.